An unusual tour of organists takes place August 13-18, when six young Japanese women, “The Yokohama Lucys”, bring their talents to bear on five notable organs in New England. During their internships at the Minato Mirai Concert Hall in Yokohama, these women have trained with resident organist, Hatsumi Miura, on a pipe organ affectionately nicknamed “Lucy.” Lucy is the three-manual, 62-stop instrument built in 1998 (Opus 110) by C. B. Fisk, Inc., the renowned organbuilding firm in Gloucester. Miura, who organized the tour for her interns, has concertized in numerous cities in America as well as in Europe and Japan, and is a professor of organ at Ferris University in Yokohama. She was recently celebrated for her significant cultural contributions to the city of Yokohama. On Monday, August 13, at 7:30 PM, three of these distinguished performers will present a concert on the newly completed Fisk organ, Opus 137 at Christ Church Andover, 25 Central Street, in Andover. The concert features repertoire from many eras, including new works from Japanese composers. Barbara Bruns, Music Director and organist at Christ Church Andover was born and raised in Japan and is delighted to welcome her Japanese colleagues to play this recital even before her official inaugural recital of dedication on September 29 at 7:00 pm. On Tuesday, August 14, at 8:00 PM, the other three performers will take their turn on the organ bench at the historic Old West United Methodist Church, 131 Cambridge Street in Boston. A part of the Old West Summer Series, the concert features familiar repertoire. Old West’s organ, Opus 55 of the Fisk firm, was built in 1970 and is one of the premiere pipe organs in the country. It served for many years as the concert organ for the New England Conservatory. Miura, who was educated at NEC, has played recitals on Opus 55 on several occasions since her days at NEC. The tour continues on Friday, August 17 at 8:00 PM when Yuka Saruwatari and Reiko Okamoto play the Jeremy Adams Organ at the Annisquam Village Church, 820 Washington Street, in Gloucester. The Adams two-manual, 13-stop instrument was built in Danvers in 1986. The program features works from many traditions, culminating in an exciting duo of the “Hallelujah Chorus” from Handel’s Messiah. Kathleen Adams, Music Director, at the AVC, notes that Miura played one of her graduate recitals on the Annisquam organ when she was studying under the legendary Yuko Hayashi at the New England Conservatory. Hayashi, now retired from NEC, will be attending some of these concerts, underscoring the lineage which has ensued from her pedagogy. On Saturday, August 18, starting at 7:30 PM, two recitals back to back on Fisk organs next door to each other will feature another two duos of “Lucys.” Kumi Shibusawa and Momoko Koshimizu, will play on C.B. Fisk’s Opus 97 at St. John’s Episcopal Church, 48 Middle Street, in Gloucester. Included on their program is a four-hand/four-feet arrangement of movements from Mozart’s “Eine kleine Nachtmusik.” The two-manual, 18-stop organ at St. John’s was installed in 1988. Mark Nelson, Music Director, recently retired from organbuilding at Fisk after more than 30 years with the firm. Nelson has recently formed the Cape Ann Choir School at St. John’s, open to children 6 years old and up. The music of the evening continues next door at the Gloucester Unitarian Universalist Church, 10 Church Street, in Gloucester following light refreshments served on the lawn in front of the church as the audience traverses from one church to the other. 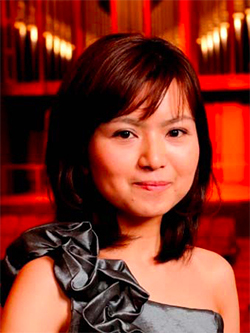 At 8:30 PM Mineko Kojima and Naoko Asao play the concluding recital on the 1962 Fisk rebuild of an 1893 Hutchings organ. Their program will feature a variety of organ music including that of contemporary Japanese composers. All the concerts are free (with free-will donations) and open to the public. For information call 978.283.1909.